BRANDON – The countdown is on to the Brandon Bobcats basketball teams hitting the court for another exciting season of action. The Bobcats' first contests of the season will take place on the road against Alberta, while the first home action is set for November 11 against UBC-Okanagan. The Bobcats 2016-17 schedule was released Thursday morning following the publication of the Canada West conference schedule. -The Bobcats will play 11 home dates and 9 on the road. -New conference format including playoff structure. -Explorer and Pioneer divisions no longer. -Day games for school groups on January 13. -Final regular season home games against rival Manitoba. -Home games to be broadcast on WCGtv. The home-opener for both Bobcat teams will be on November 11 against the Heat at the Healthy Living Centre with tip-off set for 6 pm in the women's game and 8 pm in the men's contest. The Bobcats will also welcome Winnipeg, Fraser Valley, MacEwan, and Regina to the friendly confines of the HLC before closing out the regular-season against Manitoba on February 4. The contests against MacEwan on January 13 will be day-time games, with start times scheduled for 12 pm and 2 pm, which will provide an exciting opportunity for school-aged children to catch the action. Schools are encouraged to contact BU Athletics (link to Tyler's contact info) to register. Tickets for all Bobcat games, as well as season ticket packages and Bobcat Nation memberships, will go on sale in September. The Bobcats will be partnering with Westman Communications Group once again to broadcast all homes on WCGtv Channel 12. Westman is also the official video provider for the brand-new LED video screen in the Healthy Living Centre. Once again this year, all home and road games will feature live video and live stats at www.canadawest.tv so fans can follow the action on any computer, tablet or smartphone device. Canadawest.tv passes will go on sale August 22, with early bird pricing in effect until September 9. 2016-17 marks a new format for Canada West basketball, with the existing Pioneer and Explorer Divisions no longer in effect. The 17 Canada West basketball schools will now play in a single conference, featuring a 20-game regular season schedule. Each team will play four geographical, or historical opponents every year, with games against six of the remaining 12 opponents every other year. Over a four-year rotation in the schedule, each team will play every team in the conference at least twice, and will visit every gym in Canada West at least once. 2016-17 playoffs will feature the top 12 teams playing a bracketed post-season structure over a three-week period. The top four teams will receive a bye in the first week of the playoffs, which will feature four best-of-three series. The following week will consist of four best-of-three quarterfinals, leading to the Final Four hosted by the highest remaining seed. Playoff seeding will be determined by a rating percentage index (RPI), which will be calculated using a combination of winning percentage, opponents' winning percentage, and opponents' average winning percentage. The conference RPI will be published on a weekly basis following the conference's December break. February 4 – Final regular season home game against Manitoba. NEW WESTMINSTER – Canada West basketball returns to the court Friday, November 4 with a new format, as the conference's men's and women's schedules were released Thursday, June 23. Manitoba (both women's and men's basketball teams) plays at Calgary in the season opener weekend and then host Thompson Rivers on Nov. 11-12 weekend. Looking to defend their conference crowns from a year ago will be the University of Saskatchewan Huskies, who claimed Canada West women's gold to go along with CIS gold in 2015-16, and the University of Calgary Dinos, who claimed their first conference men's title since 2009 last season. Saskatchewan opens their campaign on the road with a weekend series against the Fraser Valley Cascades, while Calgary tips things off in the Stampede City against the Manitoba Bisons. The 2016-17 playoffs will feature the top 12 teams based on win/loss record playing a bracketed post-season structure over a three-week period. The top four teams will receive a bye in the first week of the playoffs, which will feature four best-of-three series. Playoff seeding will be determined by a rating percentage index (RPI), which will be calculated using a combination of winning percentage, opponents' winning percentage, and opponents' opponents' average winning percentage. The conference RPI will be published on a weekly basis following the conference's December break. The season culminates March 9-12, as the CIS men's Final Eight returns to Halifax for the first time since 2012, while the University of Victoria welcomes the best women's teams in the nation to the school's beautiful $77-million athletic facility, CARSA. Once again this season you can see every men's and women's basketball game live and on-demand by heading to Canadawest.tv – the official streaming home of Canada West. 2016-17 Canadawest.tv passes will go on sale August 22, with early bird pricing available on both multi-sport and single sport passes available until September 9. 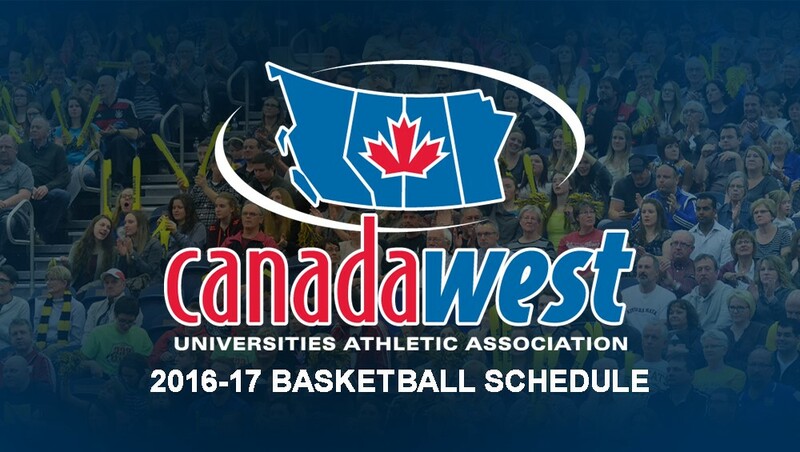 For a complete look at the 2016 Canada West men's basketball schedule click here, and for the women's schedule click here. The University of Winnipeg Wesmen is pleased to announce the release of the 2016-17 Canada West Conference Men's and Women's Regular Season Basketball Schedules for the upcoming season starting in November. The Wesmen men’s and women’s basketball teams led by head coaches Mike Raimbault (men) and Tanya McKay (women) will begin regular season play on Friday, November 4 on home court against the UNBC Timberwolves. Winnipeg will play six of their first 10 first half games on home court. UNBC, Lethbridge, Brandon and Manitoba will visit the Dr. David F. Anderson Gymnasium in first half action. The basketball portion of the 26th Annual Duckworth Challenge will take place on Saturday, December 3rd with the Manitoba Bisons paying a visit to the Wesmen home gym. Following the December break, Winnipeg will be on the road for six of ten second half games. The Wesmen will kick off their second half schedules at home on January 6-7, 2017 against the Trinity Western University Spartans. The 2016-2017 regular season schedules will conclude on February 10-11, 2017 on the road against the University of Victoria Vikes. Winnipeg will play a total of 20 regular season games (10 home and 10 away). Note: 2016-17 marks a new format for Canada West basketball, with the existing Pioneer and Explorer Divisions no longer in effect. The 17 Canada West basketball schools will now play in a single conference, featuring a 20-game regular season schedule. Each team will play four geographical or historical opponents every year, with games against six of the remaining 12 opponents every other year. Over a four-year rotation in the schedule, each team will play every team in the conference at least twice, and will visit every gym in Canada West at least once. Playoff seeding will be determined by a rating percentage index (RPI), which will be calculated using a combination of winning percentage, opponents’ winning percentage, and opponents’ opponents’ average winning percentage. The conference RPI will be published on a weekly basis following the conference’s December break.